International jiu-jitsu tournament “European IBJJF Jiu-Jitsu Championship 2018” that took place in Lisbon, Portugal, came to an end yesterday. Ukrainian fighters from SC “Borets” / ZR Team have demonstrated great skills and returned home with medals. Roman Nepota became the winner of the “European IBJJF Jiu-Jitsu Championship 2018” among the blue belts. Yaroslav Blazhko won bronze medal in the purple division. Both fighters demonstrated a high level of fight and proved they can compete at the international level. In total, by the end of the 6-day championship, Ukrainian sportsmen have won 1 gold, 1 silver and 3 bronze medals. Ievgen Skyrda, the head coach of the SC “Borets”, expressed thanks to all who supported team during the tournament. Special appreciation Ievgen expressed to the team’s sponsor - BioTexCom clinic, for the invaluable assistance and full support. 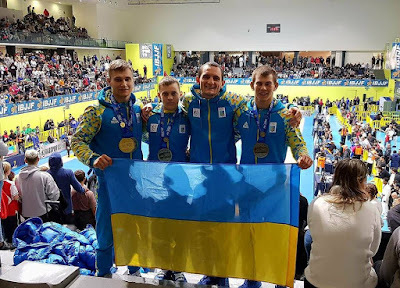 Also Ievgen Skyrda noted that the “European IBJJF Jiu-Jitsu Championship 2018” was a good jolt for sportsmen and motivated on constant endeavour at their self-improvement route.